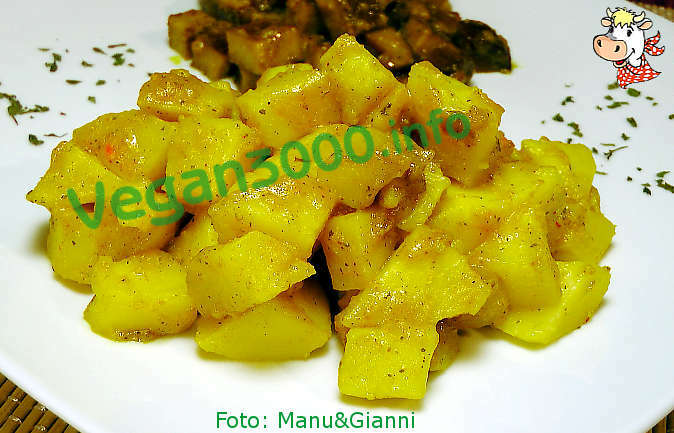 Wash and peel the potatoes, cut them into cubes and cook for 20-25 minutes steaming. Salt lightly and flour them. While the potatoes are cooking, prepare the sauce by mixing the cream with the curry powder in a bowl. Grease an ovenproof dish, arrange the potatoes and add half of the cream with the curry. Mix thoroughly and cover with the rest of the cream. Bake in a preheated oven at 180° C for 20-30 minutes, until the potatoes are fully cooked. Once cooked, sprinkle with chopped parsley and serve hot.